Oroville, CA -- Twice per week at 4:30 p.m., elementary students at Wyandotte Academy’s expanded learning program rush to meet their ninja mentors, the STEM Ninjas! STEM stands for science, technology, engineering and math, and the STEM Ninjas are a special group of six, high school students in a program started by The Boys and Girls Club of the North Valley (BGCNV) and Butte County Office of Education (BCOE). The STEM Ninja’s program provides job training experience for teens and STEM knowledge to elementary students in Oroville. “We are so thrilled about this partnership and so proud of our teens,” says BGCNV’s Rashell Brobst, who worked with BCOE’s superintendent Tim Taylor to get the project started. When the STEM Ninjas arrive after school, they work with the elementary students in small teams. Each team has a unique name for the week and competes against the other teams. The competition centers around a project that involves designing and building something (a bridge, for example) that utilizes knowledge from the fields of science, technology, engineering and math. The STEM Ninjas provide the students with guidance on technique and critical thinking skills, and after a 30-minute build time the groups debrief together, and then go on to have fun with what they’ve built for the day. Each week builds on the previous week’s experience. “STEM education provides an avenue for our students to problem solve, take risks and think creatively today, so they are equipped to become the researchers, leaders, teachers and innovators of tomorrow.” says Tracey Allen, the Director of Professional Learning for BCOE. “Partnering with the Boys and Girls Club in the creation of STEM Ninjas not only provides these opportunities to our elementary-aged students, but it also prepares our teens for college and career opportunities”. 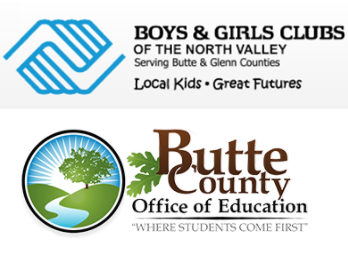 For more information, or to help grow the Butte County STEM Ninjas, contact Rashell Brobst, CEO, The Boys and Girls Club of the North Valley at (530) 899-0335 or Tracey Allen, Director of Professional Learning, Butte County Office of Education at (530) 532-5730.